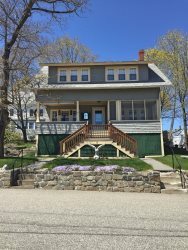 4 BEDROOM Beach home - sleeps 12! 3/34: The deck can be accessed from the Master bedroom on the second floor. A location for summer vacation that can't be beat! This home is about a 5 minute walk to Short Sands, or 13 minutes to Long Sands Beaches and Summer Season fun! Years of family memories hve been made here and now it's your turn to make them with your friends and family! Take in the Ocean views from the large second floor rear deck with sliding door access from the Master bedroom as well as exterior staircase. Walk to beach, shops and restaurants, listen to music under the pavilion and have the kids frolic at the beach playground. Watch the seasonal fireworks display from the deck! All the makings for lifelong memories...This large home can easily accommodate 12 people. 4 bedrooms, 2.5 bathrooms, laundry, 2 living areas, large eat in kitchen and dining area, 2 closed in porches and an ample flat yard for recreation and relaxing. Donna was great to work with us to leave the keys at the satellite office in York so we could avoid the Saturday afternoon traffic into Ogunquit. She was also very responsive when we had an issue with the WiFi. Thank you! One again, we totally enjoyed our 2 week stay at 50 Broadway in York. The new deck this year was a pleasant surprise. Our only complaint is that some of the mattresses are ready for replacement (specifically the king bed in the master bedroom).